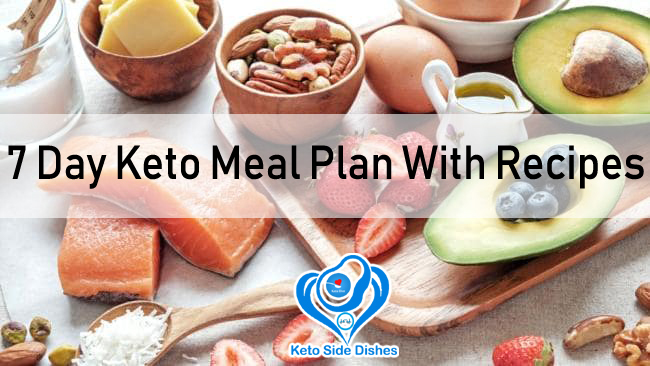 Following keto can be simple – especially if you have a plan. Below we’ve included a handy 7 Day Keto meal plan sample that is free to use. The whole goal of a keto diet is to get into ketosis. This isn’t an overnight thing. Generally, two weeks of low carb eating is a good start. It takes time for our bodies to adapt to a keto diet. Keep in mind this might not be an easy transition – some people experience Keto Flu << Read more about that there. Make sure you’re staying hydrated and are getting enough electrolytes this will help with keto flu symptoms. As your body begins to wean itself off it’s addiction to carbs, sugars and processed foods – you will experience weight loss. Don’t worry about restricting calories at the start of your two-week ketogenic diet. It’s unnecessary and not recommended until you get in the groove of things after a couple weeks on a keto diet plan. Use our 7 Day Keto Meal Plan below to help get you started. 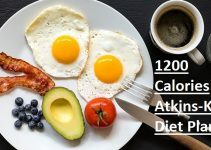 Use a keto calculator to find out how much YOU should eat. 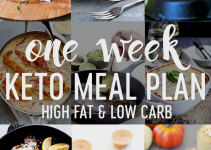 To make things real simple in the beginning, we’ve made this 7 day keto meal plan sample for you. Hope you enjoy and find it helpful on your new keto journey. Keep in mind that this is a transitional plan. It isn’t perfect and neither are you. 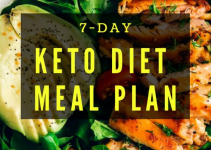 Generally, on Keto you want to stay within a certain macro range, this plan is pretty close, but not exact – but it’s okay because you’re transitioning along with this 7 day keto meal plan sample. When you finish this plan try to lower your carbs even lower if you can. 20-25 max a day. The following recipes correspond to the above 7 day keto meal plan. If you feel like you want to add a snack where there isn’t one – by all means – add it. Olives, avocados and nuts/seeds are good high-fat snacks. You could also make some keto fat bombs! 1. Make the batter by cracking the egg and whisk it with the melted 2 TBSP coconut oil, mixing well. Stir in the almond flour and stevia. The batter will be a little thicker than normal pancake mix. 2. Heat the pan over medium heat with coconut oil. 3. Drop some batter onto the pan the size of a pancake you’d want. When the bubbles start showing up on top flip the pancake and cook for another minute. Repeat if needed until done. 4. Top with ghee or Smart Balance. 3. Cook the steak in the skillet until done. 4. Remove the steak and let cool for about 5 minutes. 6. Slice the steak and serve with avocado salad on top over the greens. Enjoy! 2. Rinse the pork chops and season with salt and pepper. Set aside. 3. Blend mustard, thyme and crushed garlic. Pour over the pork chops and coat each sides. 4. Heat up an oven-proof pan with 1 TBSP coconut oil, brown the pork chops and transfer to the oven. Cook for another 5-8 minutes. 5. Sauté the broccoli in the remaining 1 TBSP coconut oil. 6. Serve broccoli and pork chop together. 7. NOTE: SAVE 1/2 THE RECIPE FOR LUNCH TOMORROW AS *LEFTOVERS*!!! 1. Add yogurt to a bowl. 2. Sprinkle the berries and nuts on top. ENJOY! Eat these whenever you feel hungry throughout the day. 1. Brown the beef in oil, stirring frequently. Once the beef is cooked, add the sliced zucchini. Stir. 2. Season with chili powder, salt and pepper. Cook for a few minutes. Turn off the heat. 3. Drizzle with lemon juice and serve. 1. Preheat oven to 350°F and grease muffin pan. 2. Put one slice of bacon into each hole of muffin pan and then split an egg on each one. 3. Bake for 10 minutes for semi, soft yolk. Cook under 10 minutes for runny yolk and more than 10 minutes for hard egg. 4. NOTE: SAVE 1/2 THE RECIPE FOR *LEFTOVERS* ON FRIDAY!! 1. Cook bacon over high heat until crispy. 2. Remove bacon, dice it and place in a bowl with rocket. 3. Add 1 tbsp of olive oil in the pan and add walnuts, stirring until lightly roasted. 4. Combine walnuts with rocket and bacon. Add lemon juice. Toss and serve. 1. Heat oven to 350F. Cut off the tops of peppers and remove the seeds, wash and drain. 2. Grate the cauliflower, resembling rice consistency. Place cauliflower rice in a bowl, put in spices and herbs, minced garlic and onion. Set aside. 3. Heat up a pan with oil and sear the sausage, once done add to the bowl of cauliflower, add the tomato paste. Mix well. 4. Stuff the peppers with the mixture. Place in oven and cook 40 min. Enjoy. 5. NOTE: SAVE 1/2 THE RECIPE FOR *LEFTOVERS* TOMORROW!! 1. Bring a pot with lightly salted water to boil. Rinse the cauliflower and chop the sides of the cauliflower’s core to separate the florets. Chop evenly the florets. As soon as the water boils, place the florets in to pot and cook until soft. 2. Transfer the cooked cauliflower florets to a food processor, add in the salt and oil and process until smooth. Stir in black pepper and salt. 3. Transfer to a bowl and serve as a side dish. 1. Make the dressing – mix vinegar, olive oil, salt and pepper. Set aside. 2. Hull the avocado, remove the pit and slice. Put on a plate and drizzle with the dressing. Enjoy. 1. Immerse chicken cutlets in the mixture of 1 TBSP olive oil, lemon juice, salt and pepper for an hour. 2. Preheat oven to 375° F. Grease a baking dish. 3. Sauté sliced onions and garlic in remaining TBSP oil, stir. Add tomatoes and olives, stir. Add thyme. 4. Put marinated chicken into the baking dish, pour the sauteed veggies. Cover and bake for 40 minutes. Enjoy. 5. NOTE: SAVE 1/2 THE RECIPE FOR *LEFTOVERS* ON SATURDAY NIGHT!! 1. Break the eggs into the bowl and press the egg yolk to break. 2. Mix the broccoli with the eggs. 3. Add coconut oil to pan and turn on heat to medium to melt. 4. Pour the eggs mixture into the frying pan. Scramble until set. Sprinkle salt and pepper as desired. 1. Halve the avocado and remove the seed. Scoop the flesh. Reserve 1/4 of the flesh and dice. Put the rest in a food processor. 2. Peel and chop the cucumber, add to the avocado in the food processor. 3. Add the water, cumin, garlic, lemon and salt. Puree until smooth. DIRECTIONS: Enjoy as a snack whenever you feel hungry. 1. Melt the coconut oil in a pan, add the beef. Cook for 4 minutes. Add the rest of the ingredients and bring to a boil. Lower heat, simmer for 20 minutes. 2. Toss with chopped basil, stir. Enjoy. 3. NOTE: SAVE 1/2 THE RECIPE FOR *LEFTOVERS* TOMORROW!! 1. Put the meat in a mixing bowl, add all the spices and shape into patties. 2. Grill each side for about 6 minutes, or until cooked. 3. Sauté the asparagus in the oil. Serve together. 4. NOTE: SAVE 1/2 THE RECIPE FOR *LEFTOVERS* TOMORROW!! 2. Sprinkle the berries and seeds on top. ENJOY!